In Soho you might come across Inamo an Asian themed restaurant that’s received a bit of buzz for its use of technology in the dining experience. That’s probably the only reason to come. So let’s talk tech. 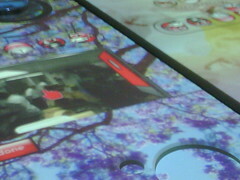 The first review I read of Inamo said it had touch screen tables. 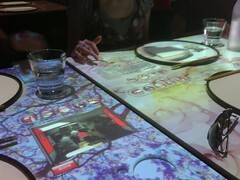 That’s not exactly true (and not Inamo’s fault for poor reporting), rather the screen is projected onto a white table from the ceiling with a small touch pad near each diner. This is used for manipulating the mouse pointer. Nonetheless I was anticipating something like Surface and I got it’s poor cousin. You’ll be able to check out a webcam of the chefs, change the table cloth “wallpaper”, find out local information, play games and of course order drinks and food. As the cloth is part of the projection they’ve kept a plate sized area white, presumably so you don’t get random images dancing over your food. However the big white patch does take away from the atmosphere. There are two games on offer. Tile puzzles and Battleship. With the latter there’s no way to block the other person seeing where you’re positioning your ships and this is in part because you can only play with the person opposite you. I would have thought it’d be easy enough to play with someone else in your group or randomly in the restaurant. The webcam is pretty interesting but you can’t see a great deal of detail. Still a cool feature. As is the local information of nearby bars, entertainment and transportation options. Ordering food is a pretty easy endeavour with the option to add and deduct items as you see fit. Now what about the quality of the food? Well, it’d be good if everyone’s meals came out at once and if the meals were a little bigger (particularly considering the cost of both the food and drinks). For an Asian restaurant it was surprising that the white rice was so poor in quality. 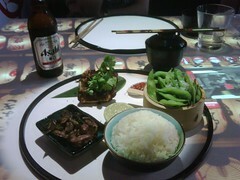 Each of us thought our respective meals were reasonable but again the price to size and taste ratio was unsatisfactory. Last but not least after the clean lines of the dining room I was surprised by the lack of tech in the bathroom -it was kind of grotty too! For tech lovers you might want to come and play with the toys but you might want to wait for a 2.0 to come out. Otherwise, Asian foodies can just give it a miss.